There are some words in a language that when placed in front of another word, they change the word’s meaning or context. Determiners are one such type. Determiners are words that when placed in front of a noun or noun phrase, they change the context of the noun or noun phrase. They give a more concise meaning to the noun. Take for example the sentence, ‘I’ll take one.’ This indicates that you want one of whatever the person is selling. Now consider, ‘I’ll take this one.’ This sentence indicates that you want that specific item from among whatever he is selling. Hence, adding ‘this’ changes the context of the word ‘one’ and of the sentence in general. ‘This’ is an example of a determiner. 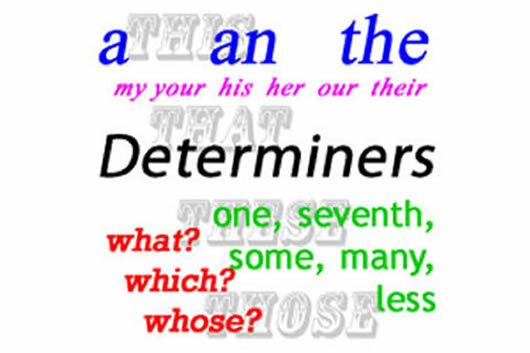 A determiner is a noun modifier, which basically means that it modifies a noun. It adds a more specific meaning to the noun, usually regarding quantity and possession. Hence, a determiner usually comes right before a noun or a noun phrase. Determiners are not a proper word class. They are in fact functional elements of structure, which means that they just serve a similar purpose and are hence grouped as such. There are many trees on the side of the road. The party involved a good deal of dancing. There were plenty of people there. Most students study for the exams. We ate all the food. Some people didn’t like the movie.